Ever heard Ed Sheeran's "Thinking Out Loud"? Update: Indeed, the heirs of late “Let’s Get It On” co-writer Ed Townsend are filing a lawsuit against Ed Sheeran, citing “Thinking Out Loud” as stealing the “heart” of the Marvin Gaye original. 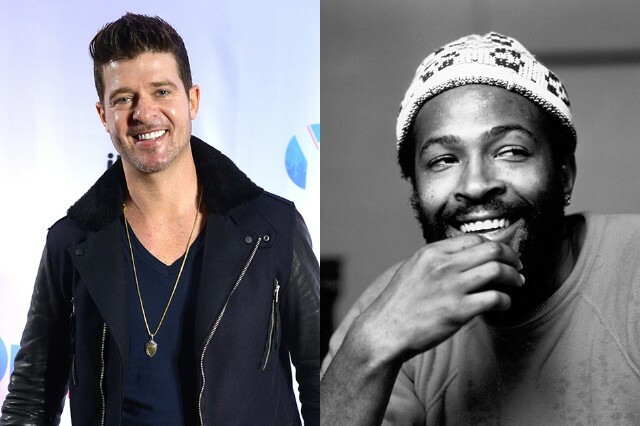 The music industry was rattled last night by a Los Angeles jury’s verdict that Robin Thicke and Pharrell Williams’ obscenely popular 2013 single “Blurred Lines” copied enough of Marvin Gaye’s 1977 No. 1 hit “Got to Give It Up” that the pair owed $7.3 million to the Gaye estate for the copyright infringement. It was a surreal, months-long trial that featured Thicke attempting to deny any songwriting responsibility for his signature hit and performing a piano medley of classic pop songs to illustrate points about musical theft — neither of which swayed the jury much, apparently — and in the verdict, it has been given an appropriately bizarre ending. Thicke and Williams hardly represent the first artists to be taken to task (and to court) for improper usage of music that wasn’t theirs. In a couple of famous cases among hundreds of lesser-remembered arguments, George Harrison was sued back in 1971 for stealing the melody to the Chiffons’ “He’s So Fine” for his own chart-topping “My Sweet Lord” (setting new precedents for songwriting and publishing accreditation in the process), and the Turtles took legal action against De La Soul in 1989 for the rap trio sampling their hit oldie “You Showed Me” on the classic 3 Feet High and Rising album, one of several cases that ended up changing the rules for such direct musical reappropriation. This could be a problematic precedent. Copying the feel of another song or another artist has been going on as long as there’s been popular music. From the Knickerbockers doing the Beatles and the Hollies doing Creedence, right up to Lady Gaga doing Madonna and Bruno Mars doing the Police, Top 40 has been littered with stylistic homages that have teetered on the edge of being straight ripoffs, with little fear of legal reprisal. The alt-rock realm is hardly immune, either: If all musical artists were back-taxed for swag-jacking, Nirvana would owe the Pixies, Pavement would owe the Fall, and every artist who ever laid pop melodies over jagged waves of guitar distortion would owe the Jesus and Mary Chain (who would in turn have to fork over most of those proceeds to the Ronettes). It’d be a total free-for-all, one that threatens the intertextuality that connects so much of music history and turns new generations on to old sounds, and the other way around. “Thinking Out Loud” is a very nice ballad, one whose seductive groove, sentimental lyric, and full-hearted vocal has taken it all the way to No. 1 on Billboard’s Pop Songs chart. It is also an incredibly obvious successor to Marvin Gaye’s 1973 superlative slow jam “Let’s Get It On” — the gently loping four-note bass pattern and crisp ’70s soul drums absolutely smack of the Gaye classic, as do the embrace-insistent lyrics and general candlelit-bedroom feel. The similarity has been pointed out by pages and pages’ worth of YouTube mashups and covers, and even by Sheeran himself, who has blended the two songs in live performances. Personally speaking, I didn’t even notice the similarity between “Blurred Lines” and “Got to Give It Up” until it was pointed out to me, but the second I first heard the bass drop in “Thinking,” I was overcome with the urge to buy Levi’s. Thicke and Williams can appeal the verdict, and a healthy chunk of the music industry better hope they do so. If “Blurred Lines,” a song that taps out as an homage at worst (and not the first or even the most-famous pop song directly and admittedly inspired by “Got to Give It Up,” by the way) can be stripped of half its earnings for its degree of plagiarism, then countless artists across every musical genre need now be put on notice. And Ed Sheeran should save his millions, just in case.